Down the hill and through the woods, Carolina’s Outdoor Education Center on Country Club Road needed more reliable and less expensive phone and internet service. The center’s carrier wasn’t promising service improvements any time soon, and leasing an energy company’s power poles would have been too expensive. Besides, despite being situated in a hole within a hilly residential area and cut off from campus, the Outdoor Education Center is close to campus. It is part of the University and deserves the same quality phone and internet service provided to the rest of UNC-Chapel Hill. ITS Communication Technologies recently devised and implemented a solution for the Outdoor Education Center. The ITS division brought fiber to the OEC, tying into the campus internet service to provide the center with the University’s voice-over-internet protocol, better known as VoIP. This project for OEC marked one of — if not the last — UNC-Chapel Hill sites for which ITS CommTech still needed to install fiber to connect to campus internet. Other sites are too far off of campus to be feasible, said Chad Ray, Transport Operations Manager for ITS. The Outdoor Education Center, which is a 10-minute walk from Woollen Gym, consists of a small office building, a clubhouse building, an 18-hole disc golf course, a challenge course, three sand volleyball courts, eight tennis courts and a bouldering wall. The office and clubhouse required better phone and internet service. The hilly terrain surrounding the office building and clubhouse building was more difficult than the sites at which ITS Communication Technologies staffers typically install fiber. “This here was way out of normal for what we do,” Ray said, while walking the project site recently. The biggest issue, however, was that the property had no underground ductbank to tie into. 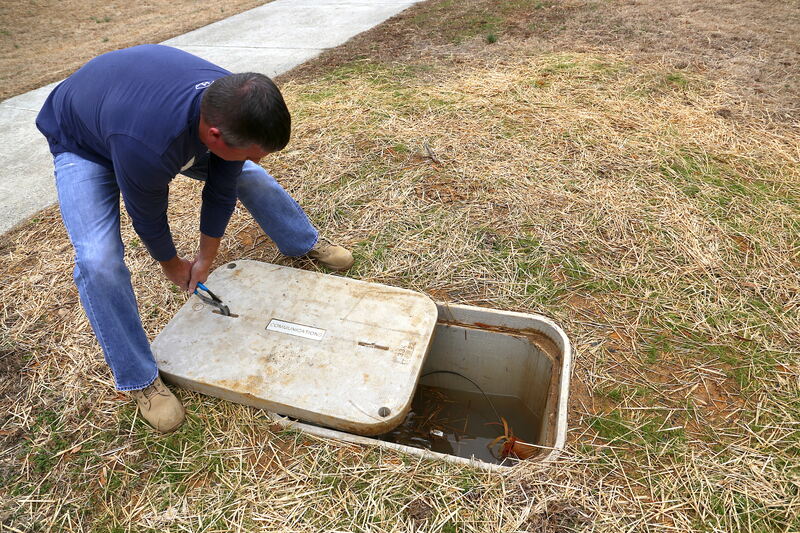 Ductbanks are collections of conduits — often buried and accessed from manholes in streets or from concrete boxes in the soil — through which various types of cables run, including fiber for phones and internet. 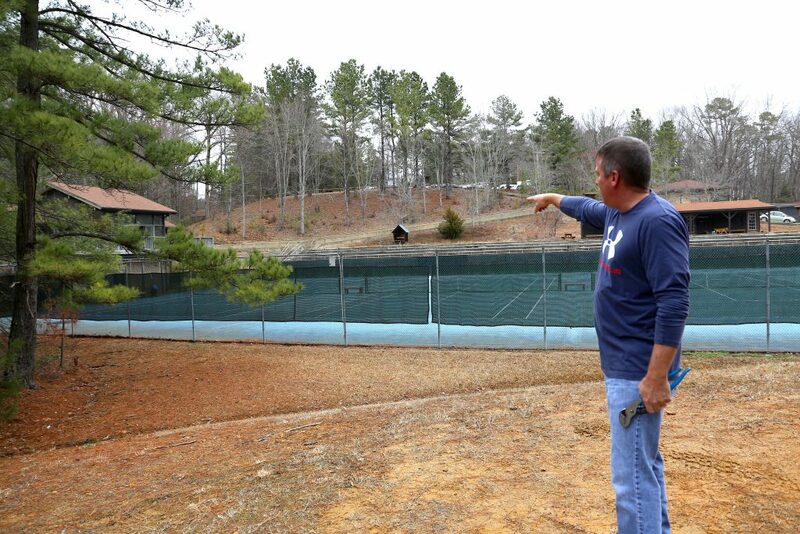 What the Outdoor Education Center property does have is the Chancellor’s University-owned house as a neighbor. The Chancellor’s residence through the woods already was on campus fiber. Communication Technologies’ solution was to run duct behind the Chancellor’s residence over to the Outdoor Education Center. In December, horizontal directional drilling equipment bored through the ground, pulling 2-inch pipe as it went along, for 2,500 feet, up and down the hilly terrain. Every 500 feet, workers installed a concrete communications box, from which they could access the orange pipe and pull fiber through. In March, Communication Technologies ran fiber from the closest of those new communications boxes and installed a network switch and other equipment to complete the job of hooking up the Outdoor Education Center buildings to the campus VoIP system. Connecting the Outdoor Education Center to the fiber-based campus VoIP system improves service and is cheaper in the long run than using private carriers for phone and internet connections, Ray said. In addition to wanting to address the Outdoor Education Center’s inadequate phone and internet service, this project also was driven by the University’s migration to VoIP from the legacy AT&T Centrex phone system. Although some clean-up work has continued, Communication Technologies finished moving the University’s phone system over to VoIP in fiscal 2016-2017. During the five years of the VoIP project, Communication Technologies replaced phones on desks and ported out the bulk of the working phone numbers to the new service provider. This move to VoIP positioned UNC-Chapel Hill for changes in telecommunications technologies and services.